To say we like pirates is a bit of an understatement. When someone mentions the words Treasure Hunt my kids jump at the chance. 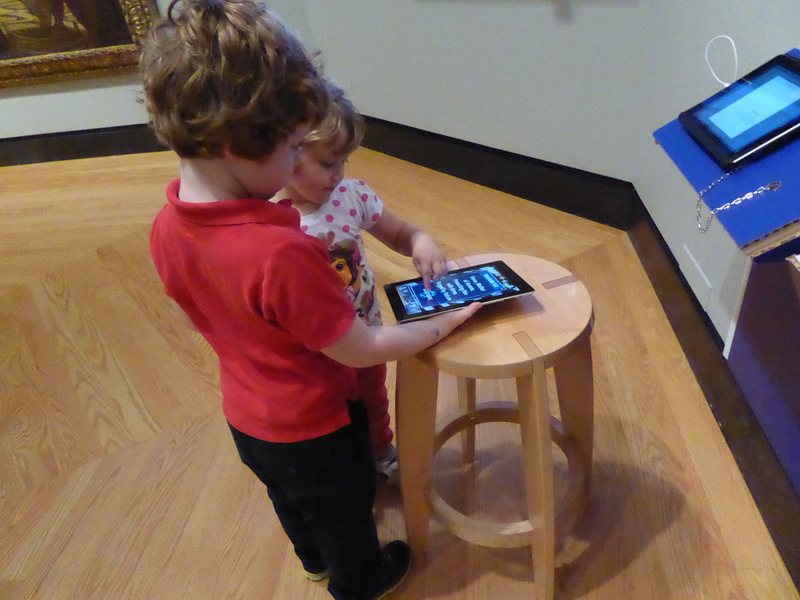 Last week, we were invited to the Art Gallery of Ontario (“AGO”) to try out their in gallery treasure hunt. My kids were excited and to be honest I was nervous as can be. Two kids, one parent, an iPad and priceless works of art. What could go wrong? Time Tremors is an app that essential transforms the AGO into a huge game. Its recommended for kids 7 to 12 but at nearly 6, my son Will really loved it. Basically, you turn on your app when you enter the AGO and have the choice to accept 1 of 4 missions. You follow directions and clues that navigate you throughout the gallery. When you figure out the clue, you earn jewels. Will, Charlie and myself attempted this together. Charlie was really intrigued at first but lost interest within half an hour. She is a little young for the app having just turned 4 and I would stick to kids 6 and older. Will could have stayed to do all four missions and in fact begged too. In the end, we completed two full missions and loved how interactive the app was. 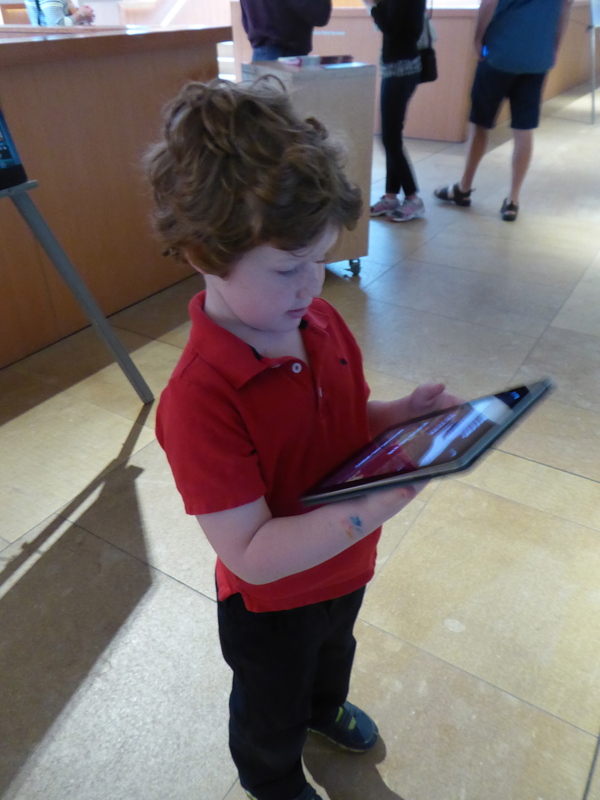 Will was easily able to read the clues and lead us around the museum. The security guards are all in on the game and will help your kids find what they are looking for if need be. I was blown away when the app instructed us to hold the iPad up to a painting and the work of art came alive. We were able to touch the iPad to find things in the painting. At one point we had to pop bubbles by spinning around the room and looking through the iPad. Educational technology at its best. I estimated we would spend under two hours at the AGO and I was dragging my kids out kicking and screaming nearly 4 hours later. I even caved and promised them ice cream if they left quickly. I was worried our car would get towed as I parked on a street that needed to be clear by 4. Check out this trailer for more information about the Time Tremors app. 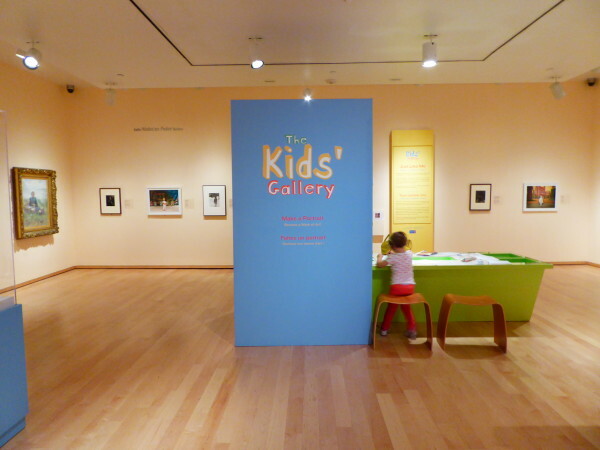 Before leaving the AGO, make sure to check out the current Kid’s Gallery exhibition. Held in a relatively small space, the Kid’s Gallery is aimed at making kids feel at welcome at the AGO. 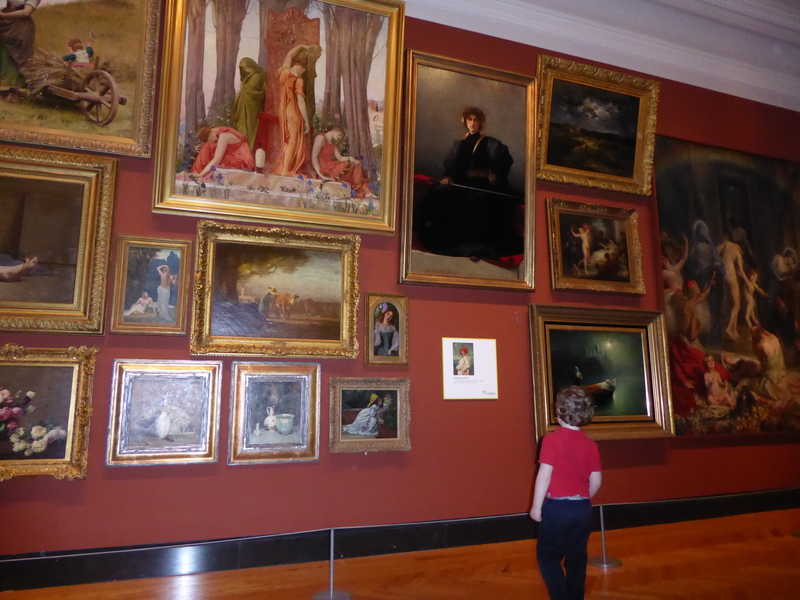 The paintings are hung lower and all feature kids. There is also an Instagram photo booth that once you take a picture and upload to Instagram projects the photo onto a screen in the gallery. Charlie loved this room, the dress up station in the photo booth and particularly the art station which invited kids to sit and make their own art that could be displayed on a shelf in the room. 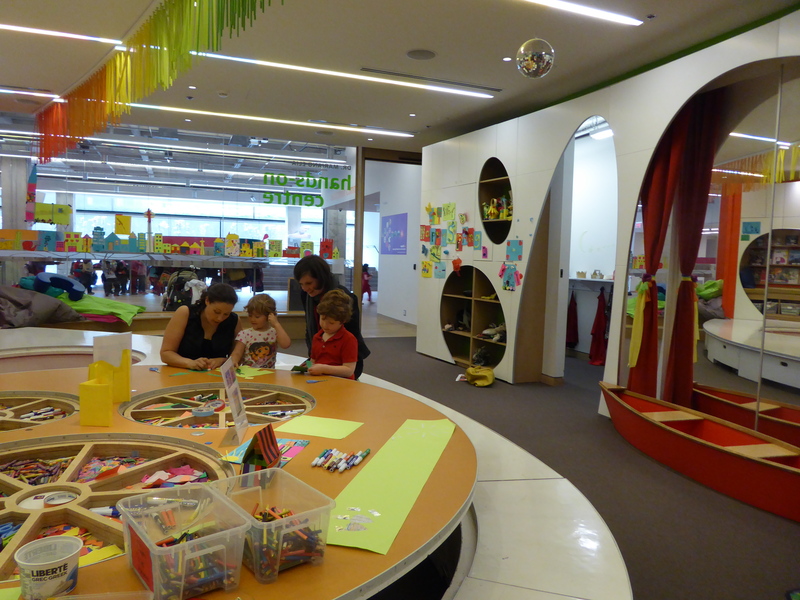 The Weston Family Learning Centre at the AGO is geared towards kids under 6. Its basically a room where imaginations are encouraged to run wild. We checked it out and loved every minute of it. The middle of the room is a large table with art supplies galore. There is also a dress-up centre, block stations, a small library and lots of places to chill out with your kids. The highlight of the Weston Centre is the staff. The two ladies at the centre welcomed us with open arms and were a lot of fun. They helped us with craft projects, hosted a sing along, and even came up with an idea for a canoe exploration across the room. The kids were encouraged to just be kids. We spent an hour in the centre laughing and playing and it was an incredibly enjoyable part of our day. 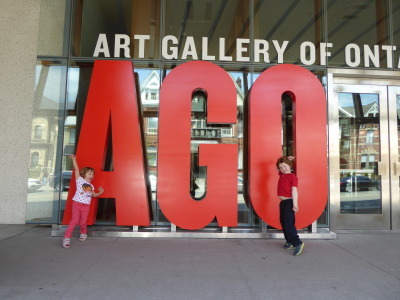 I was shocked by how much fun we actually had at the AGO. I anticipated having to tell the kids to whisper and be quiet but visitors and staff alike welcomed them with open arms. Other kids joined into our Time Tremor game with us. Adults had fun watching the kids and didn’t seem at all annoyed. Without the app, I estimate we would have seen about one quarter of the museum but with the app we had an incredible time exploring. I highly recommend giving this new technology a try. I think this is one of the coolest things I have seen! I love that they have find a way to really engage these children…I guess, right? I think I was 8 or older before I really wanted to stay at any museum!! But having been introduced them early in life, made them a part of my life and I love that this will truly keep them interested. My son is begging to go back and complete the other two! It is a very different way to get kids involved but it made them look at paintings they would never have thought twice to look at. I particularly liked when you had to search a room of paintings for one small detail. Started a lot of conversations about the other paintings. Looks like a fun place to visit! My kids are too old already for me to take them to museums. But I have fond memories of the times it worked out, sort of OK. We did go to one art museum a few years ago that made good use of tablet technology. That is amazing and very cool. I love technology when it used in this way to educate and be fun at the same time. I am guessing kids will have a whole new appreciation of art and the AGO for the rest of their lives; which I guess is the point. Very creative and captivating. 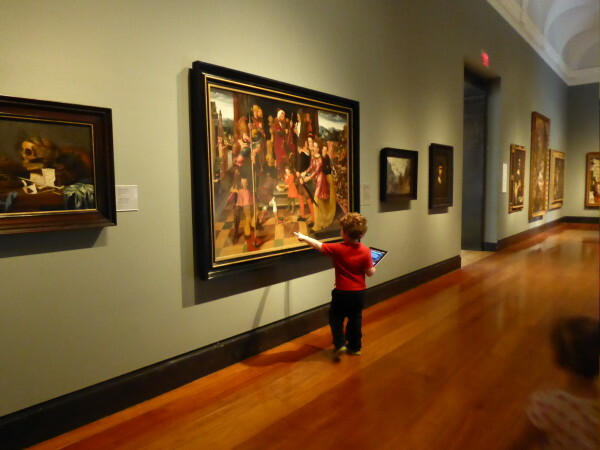 What a great way to engage children in art appreciation. I think it would be fun for adults too. I’ve been impressed lately by the ways museums and galleries are making use of technology to enhance the experience. What a fun museum with a nice balance of adult and children activities. It’s amazing the interactive and educational exhibits that are being created through technology. Lucky the kids are now-a-days.. Technology has made it so simple yet entertaining for them. In our times, video games seemed like a dream.. Speaking about this post, it is a good idea to let them learn in a sophisticated way. Hi Sarah – my son and his family live in Oakville and his three children 5, 7, 10 would love this. 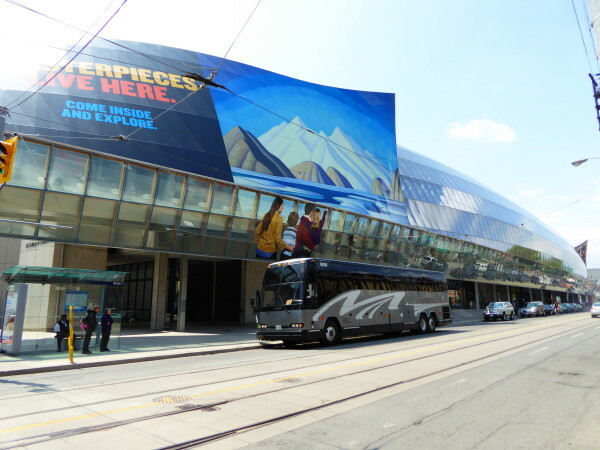 I am going there this week and will show them your site – I imagine the AGO will have a visit from them soon. This is great – thanks for writing. That app sounds like the coolest idea ever! I wish all museums would do something like that. Ontario’s a bit far for us to travel, but I know my kids would love that.